May you find peace, love and even a tiny bit of wonder today. PJ: What you guys (Adam and I) want for Christmas? Me: A pair of running socks. Adam: All I want is good kids. CT: OOOHHH, that’s gonna be hard. I’m not sure why 12 years of marriage seems like so much more than 11, but it does. It feels like a big accomplishment. It feels like we have overcome many things together. It feels like we have grown closer, sometimes farther for a moment, but always coming back together…stronger. It feels comforting. It feels precious. It feels lucky. Thank you love, for everything you do, for everything you are and for always cherishing “us”. This clearly displays why daddy is more fun than mommy. 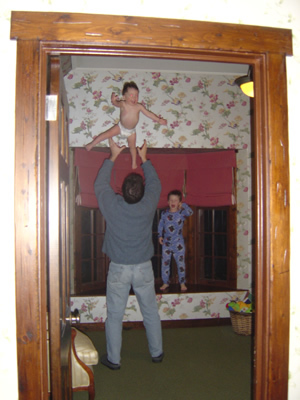 Mommy would never chuck baby three feet into the air over and over and over again. Yeah…I’m not getting him one this year, he’s been naughty. BUT, if I was, this is what it would be. And, it might just be the most perfect ungiven gift I have ever not given. You’ve moved on. You think you’re big. You don’t like tops on your sippy-cups. You insist on walking up and down the stairs. You want to sit on the highest stools, with no backs, that we have. You want to work on the laptop, on top of the highest stools that we have. You are always in the fray. You love playing chase, eating the tops off markers, falling down, being read to. You squeal with delight when your big brother comes home from school. You’re words are coming fast and furious like bees running from their hive. You, my baby boy, are becoming so big. What makes you feel oddly good? I’m really trying not to get stressed-out about the upcoming Holidays. But honestly, it’s not working. Between the cookies that are not made, the floor that is filled with heaping piles of laundry, the fondue dinner party we are having this weekend (that is no where near even thought about), our 12 year Anniversary that is coming-up, the presents that aren’t bought and last but not least the Christmas cards that I can’t get one decent photo for. I love getting photo Christmas cards of all my relatives and their kids and my friends and their kids and even all the cats and dogs that make it into the photos. And, I like composing my photos and sending them out to our friends and family with glad tidings to all. But this year, trying to get a picture of all three kids is absolutely ridiculous. I have made three attempts to capture my little cherubs so I could send them out. It is sooooo not working. One sits nicely, one sits but with a scowl on her face and the other you couldn’t get to sit in one spot for three seconds. You would think with all the photos I take of these kids there would be one good one. Or, not even a good one, but a funny one where no one is doing what they should be, but artistically it works out. No, no, no! So, if you don’t get our Holiday greeting this year, don’t think you didn’t make the cut. I just couldn’t cut it. Fa la la la LAAAAAAAAAAAAAAAA! 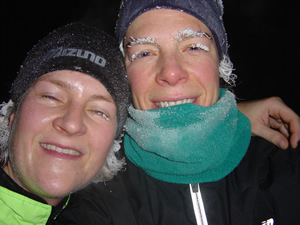 Yesterday morning I met up with Jen for our morning run. It was a beautiful morning. It was really peaceful. The temperature was slightly warmer and large snow flakes were gently falling down. We started off at Lake Harriett and worked our way a quarter of the way around Lake Calhoun. Then, through the darkness, a random car drove off the road, up onto the grass, glanced a large rock directly to our right and sped less than 10 feet in front of us onto the running path. It kept going down the path until it turned and burned its way back to the street, but only after hitting two more trees. Our initial reaction was…OH MY GOD, we almost got hit. We could have been killed. Did they want to hit us? Did they fall asleep behind the wheel? Did they have a heart attack? We didn’t know. All we knew was that we wanted to run, and run away from the car as fast as we could. We were less then 10 feet away from being taken out of this world, leaving six small children and two husbands collectively between the two of us. Had we been running a touch faster, we could have been hit. Had we not stopped to tuck my hat into my back pocket, we could have been hit. Had we not taken a few minutes to adjust our socks before we started, we could have been hit. We were steps away from not walking back into our own homes that morning. I’ll do my best little buddy, I’ll do my best.